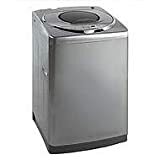 Portable washing machines are great for apartments or small homes, and some offer higher capacities for large loads. Pick one up today! Older homes and small apartments often have to make do with laundromat visits on a regular basis, spending time and money dealing with endless laundry runs. 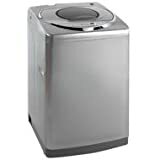 But, luckily, some rather inexpensive portable washing machines make great additions to apartments and other laundry-less situations of all kinds. High capacity portable washing machines will be able to handle more than the typical countertop model might be able to do, while still being relatively compact and portable for easy transportation and installation. Check them out and enjoy the convenience! 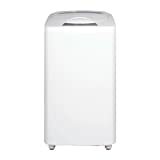 A portable washing machine can be quite useful, particularly, as might be obvious, in homes and apartments without a built-in washing machine. Although many apartments and condominiums might have their own on-site laundry facilities, it can still be a hassle to deal with, particularly when other tenants are attempting to make use of the same machine. Luckily for these apartment dwellers or homeowners, compact, portable washing machines are not prohibitively expensive, and can make life a whole lot easier. Although most portable washing machines are exceptionally compact, even fitting on a countertop, sometimes a higher capacity is more useful, particularly with families, or if a more full-featured machine is preferable. Some of the mini portable units aren't large enough to handle larger items like sheets, which can be something of a hassle. The models listed below are larger than the typical countertop model, but smaller than the average washing machine to retain portability, plus a built-in spin cycle, a feature lacking on some of the smaller models. Take a look at the options below and pick one up for your apartment or home today! Haier is one of the heavyweights of the portable appliance world, with some of the most popular, best reviewed portable washing machines you can find. They connect to an ordinary kitchen sink with a faucet adaptor, yet are full-featured machines featuring multiple cycles, decent capacity, a top loading design, and plenty of happy customers. These machines have a capacity from 1 to 1.5 cubic feet, which can handle up to 6 pounds, or about several days' or a week's worth of clothing, and can probably handle bed linens, though perhaps one at a time if necessary. They're some of the best, most popular, and highly regarded console-style, high capacity portable washing machines out there, particularly the ones listed below. So go get one. 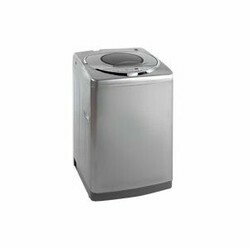 Avanti offers some stainless steel portable washing machines, with a similar design, but a much larger capacity than other models. The Avanti units are 1.75 cubic feet, and can handle up to 12 pounds, which is double the capacity of the Haier units listed above. They're larger, of course, but for those with kids or who prefer to run larger loads less frequently, they're great. Plus, everyone loves stainless steel. The units have multiple settings for different fabric needs, and they hook up to a faucet with a faucet adaptor, and the wheels allow easy transportation around the house. This is also useful if the unit is stored under a countertop, as it can be rolled out for use, and rolled back under while it's running, or being stored. 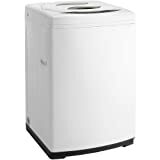 Other brands making portable washing machines include Danby, which is another major player in the portable home appliance market, and GE, which manufactures pretty much everything. The Danby model is about the size of the Avanti models listed above, while the GE model is actually a 3 cubic foot capacity machine, and thus somewhat larger than the others. While most home appliances are simply purchased out of convenience, it is altogether likely that, under certain circumstances, a portable washing machine will actually be more cost-effective and less energy intensive than visits to the local laundromat on a regular basis, especially if any amount of driving is involved. This cost will likely pay itself back if children are involved, or if someone has otherwise frequent laundry needs, such as those working outside in the heat, and need clean clothes on a regular basis. All those quarters add up, and over the course of a couple years, depending on one's needs, a portable unit in an apartment might be the better choice. So, with that in mind, pick one up today and enjoy! Pick up a cheap portable washing machine for apartments or smaller homes, and skip the trip to the laundromat every time. Check out the best cheap portable dishwashers available, check out reviews, and buy online!